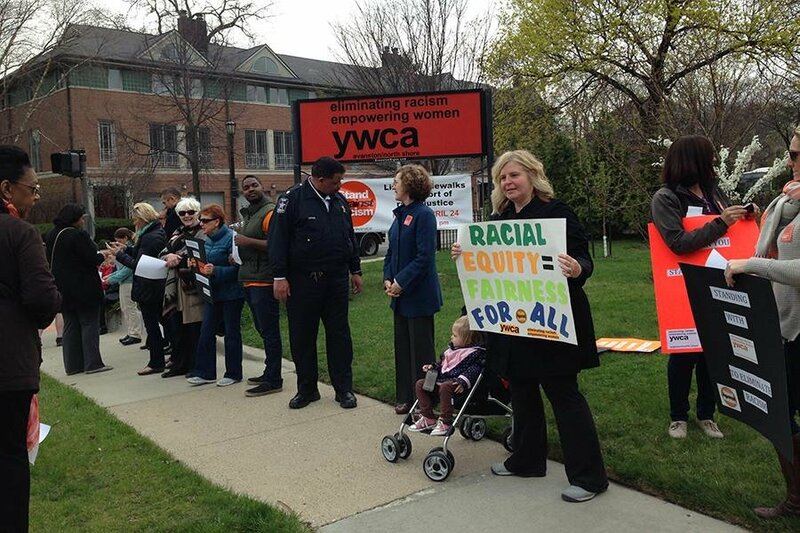 People line the sidewalks in front of the YWCA Evanston/North Shore for the annual Stand Against Racism. Around 3,000 people participated in the Evanston event this year, the largest number of participants the city has seen. Around 3,000 people took to the streets of Evanston on Friday afternoon to raise awareness of and fight racism. This was the largest crowd that has ever come out in the city for Stand Against Racism, an annual nationwide campaign sponsored by the YWCA. People from more than 80 groups lined up along Ridge Avenue and Church Street to support the movement, which aims to address the negative impact of institutional and structural racism, according to the YWCA website. In its fourth year, the event, hosted by the YWCA Evanston/North Shore, started in Skokie and Niles Township at Friday morning with around 3,000 people, said Eileen Heineman, YWCA director of racial justice programs. Another 3,000 people then came out for the event held later that day in Evanston, Heineman said. This was the first year Skokie has held an event for Stand Against Racism. Heineman said the high participation — which was much greater than it has been in the past — was most likely due to recent events nationwide that have revived discussions about racism in society. Participants held handmade signs that encouraged cars to “honk for fairness” and read a pledge together against racism. On one block, groups gathered to discuss flaws in the criminal justice system, Heineman said. Former city mayor Lorraine Morton — the first African-American to hold the position — came to the event to show her support. The city has a history of working to be fair to all residents, going back to struggles for housing open to all races, she said. The issues addressed by the event carried personal meanings for many community members who participated. Karen Chavers, district director for the Cook County Commissioner for the 13th District, said she has participated in the Evanston event for the past four years. She said although the city has been fortunate to have such a diverse community, it is still important to show continual commitment to improvement. Jordan Rucker, a YWCA employee and a lifelong Evanston resident, said the issue of racism has become increasingly significant for him over the years because of the city’s efforts to raise awareness and start a conversation. Almost 100 kids from the Child Care Center of Evanston cheered and chanted as they stood on the sidewalks. “It’s important to introduce to children the idea of standing up to fairness as soon as possible,” said King Hampton, a teacher’s aide from the center. Various Northwestern departments and groups also joined the stand, amounting to the largest participation the university has ever had, Heineman said.